By Tommy Robbins. This is LOAD FILE, where sentient armor suits got nothing on our buddy Bird-Dog. This week, Tommy reviews ‘The Last Guardian’, developed by genDESIGN and SIE Japan Studio exclusively for the PlayStation 4. After nearly ten years in development, SCEJ’s Team Ico can finally rest. Their newest title, The Last Guardian, is out. What’s more, it exhibits a mastery of their craft; it spans from subtlety in storytelling and visual direction, to an understanding of scale, both of which manifest into the game’s masterful level design. By bringing these principles together and executing their project with grace and humility, Team Ico weathered a potential disaster and held onto their distinguished reputation in the process. The introduction of The Last Guardian holds true to the Team Ico experience. The brief, cryptic opening establishes only a sense of place, which leaves the story to unfold organically through the player’s exploration. That lack of exposition is intentional; we lean about this world and its rules through the game’s young antagonist, and his interactions with a wounded Trico — a giant, dog-like creature, with the talons and feathers of a bird, long hairy tail of a rat, and the reflexes and agility of a cat. Volatile but in need of care, this magnificent creature’s whimpers coax you to his aid, bringing this vulnerable young boy to his side. This burgeoning friendship creates a cautious affection in the player by proxy. Because how could it not. As Trico recovers, his reticence towards the boy begins to wear, and in time his appreciation begins to show. 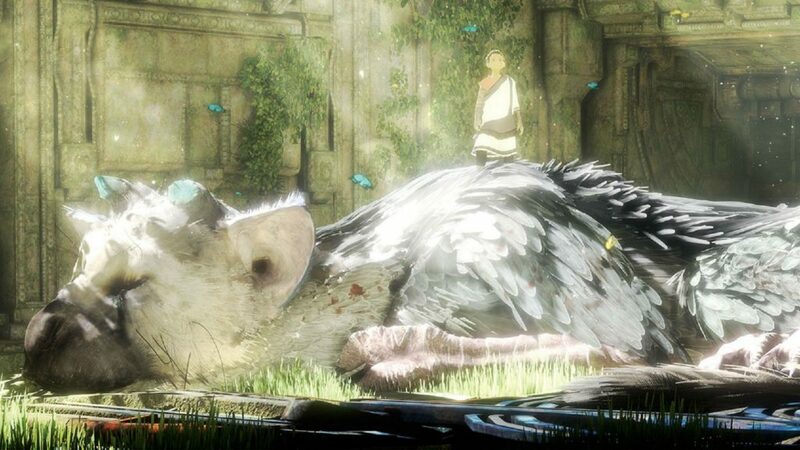 It’s here that Ico’s hard work becomes evident: Trico’s many moments of enthusiasm (feeding him is a pleasure unto itself) and agony in dire times goes a long way at removing the game’s artifice that he is simply a marvel of art and programming. Trico comes to life. 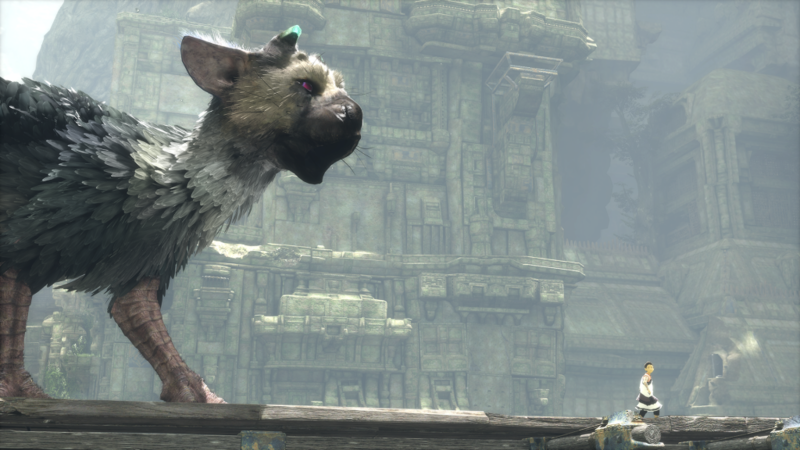 More than a pet, Trico is a companion who relies upon the boy as much as the boy relies upon Trico. 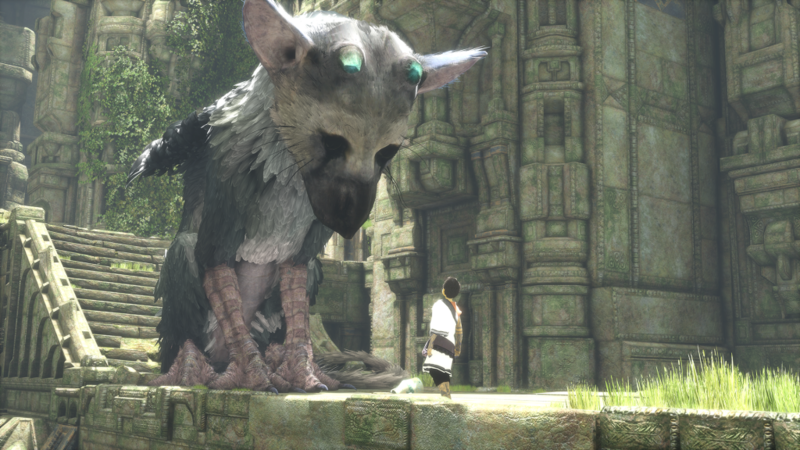 The challenge of The Last Guardian will be escaping the ruins surrounding the boy and his giant friend. Throughout their journey an ancient evil, intent on preventing Trico and the boy’s escape, creates peril at every corner. Mysterious stained-glass displays induce fear in Trico, which impedes his progress while suits of armor spring to life to drag the boy through arcane doorways into other realms. 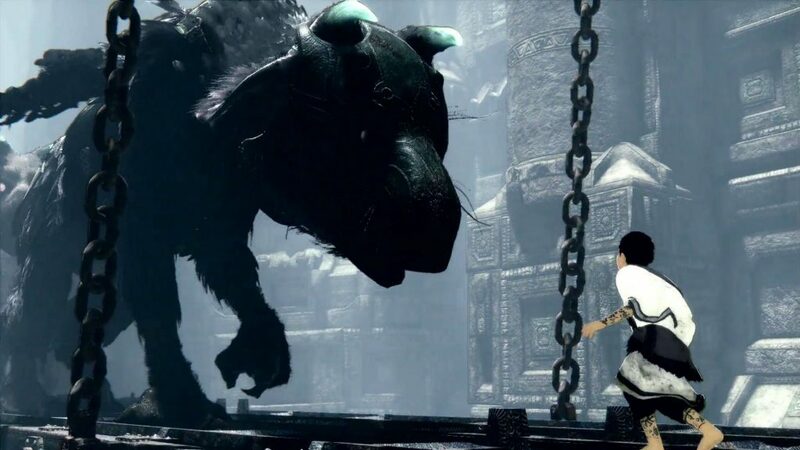 Packed with crumbling, narrow corridors and ornately designed temples, the environment occasionally forces the boy to separate from Trico, usually to access a lever from the other side of a door, allowing Trico to progress. Navigating away from your friend leaves you feeling vulnerable, beset with a longing for safety which is, in turn, satisfied when the gate creaks open and though it prances Trico, who is equally thrilled about your reunion. On the other hand, the boy depends on Trico in a similar way. Claustrophobic tunnels open into immense open spaces. In these moments the boy becomes dwarfed by the scenery. But with Trico at his side, he is empowered, ready to overcome any obstacle that comes his way. Behind the game’s thoughtful narrative is its masterful level design. In between thrilling traps and fearful enemies comes a comforting elegance as the scale of the world soon transcends its mere grandeur. Some of the more thrilling moments in The Last Guardian come from discovering that, upon Trico’s back, ledges and towers that felt like far-off set design are now within reach. What would have been mere vistas in other titles are actually entry points for serious, massively-scaled platforming. (Hopping onto the giant’s back, even he’s excited to show where he can take you.) The realization that you now must think bigger than the typical scale of games is what makes The Last Guardian special. This design creates a dilemma for the boy and Trico; they must depend on each other if they want to find a solution. That shared responsibility becomes the catalyst for their growing relationship. As magnificent as the scenery, storytelling, and level design may be, every relationship has its ups and downs. When Trico understands our commands the feeling of progression is flawless, but there are moments where Trico can occasionally become downright insufferable. The solution should only last as long as it takes the player to discover it and execute alongside his feathered friend; it’s that whole “execution” thing that Trico can get hung up on. When Trico becomes confused, he’ll begin to glance away disinterestedly and at times he’ll start pacing around the area like a dog that needs to be let outside. It’s easy to ponder over some of the game’s creative choices in these moments: Is this Ico’s masterful interpretation of animal behavior, or is it just bad design? Is Trico acting as a willful, wild animal, unsure about the commands being given by his new friend, or is the AI just completely baffled by my input? (His reactions were such that, for the most part, the animal’s behavior seemed intentional. So, I went with that.) Landing on the conclusion that Trico was confused (or was entirely disinterested) by the boys commands certainly added an entertaining context but that only mildly fixed the issue — there was still the matter of having a partner that only helped out when they felt like it. Team Ico nurtures this bond, tenuous as it can be at times, by focusing their narrative through the lens of exquisite level design. Struggling with adversity both big and small, Trico and the boy’s implausible friendship transforms as their trust in each other builds. The Last Guardian plays with empathy, which serves to remind us that when unlikely allies unite in the face of adversity, they become stronger together. Though flawed in some technical respects, the use of the game’s level design helps the player navigate a thoughtful and profound gaming experience unlike anything in recent years. Developed by genDESIGN and SIE Japan Studio. Published by Sony Interactive Entertainment. Designed by Fumito Ueda, Masanobu Tanaka, and Suchol Lee.